Although you may think that hair loss is strictly a male disease, you may be surprised to find that women make up 40% of hair loss sufferers. 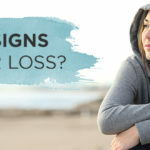 Whether it’s sudden hair loss in women or gradual, most women suffer in silence, too upset or embarrassed to admit what they’re going through or to seek help. Instead they change their hairstyle or hair color in an effort to cover up the real issues at hand. With over 30 years of experience in the hair loss and treatment industry, we understand that thinning hair or even hair loss can be traumatic. The first step is to know your facts: do you know the type of hair loss you have, or why you are losing your hair? Knowing these answers can help determine the best treatment for you, and give you back the confidence you deserve. Androgenetic alopecia, or female pattern baldness, is the most common form of hair loss in women. Genes play a large role in this disease, and it can be passed on from either the mother or the father, and can start as early as the late teens. Unlike males, who will lose hair in the crown of their hair or on the top of the scalp, female pattern baldness is characterized by widespread thinning on the scalp. 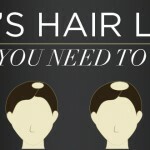 The first sign of hair loss is often widening of the part or the ponytail becoming smaller. 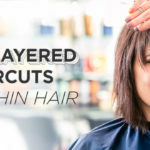 When hair follicles in the anagen (growing) phase or catagen (resting) phase abnormally transition to the shedding (telogen) phase, it is known as telogen effluvium, and can cause sudden hair loss in women. It is usually brought on by a stressful event, and can incite handfuls of hair to fall out at a time. The good news is that recovery is almost always possible with this type of hair loss in women. This condition is caused by tight hairstyles that pull at hair over time and cause damage to the hair follicles. 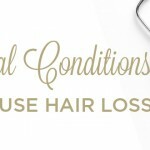 If the condition is detected early enough, the hair will grow back successfully. Braiding, cornrows, tight ponytails, extensions and weaves are the most common hairstyles that can contribute to traction alopecia. Alopecia areata is an autoimmune skin disease that results in hair loss on the scalp and elsewhere on the body. It occurs when your immune system mistakenly attacks hair follicles, which is where hair growth begins. It is not permanent, but experts do not know the cause of the attack on the hair follicles. 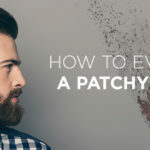 Patients and doctors usually begin to notice when clumps of hair fall out, causing small, round patches of visible and exposed scalp on top of the head. In about 90% of people with this condition, the hair may return within a few years. To read more, visit our blog post on alopecia areata. 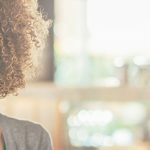 Now that you know the different types of hair loss that can occur in women, it’s important to understand the causes, and how you can prevent or postpone hair loss from happening. Knowing the different ways in which hair loss can affect you is just as important as knowing the different types of hair loss. By understanding what is causing the problem, you have a chance to stop or delay hair loss from happening. Androgenetic alopecia can be caused by a variety of factors tied to the actions of hormones, including, ovarian cysts, the taking of high androgen index birth control pills, pregnancy, and menopause. For pregnancy-related hair loss, hair will fall out immediately following birth, since little to no hair falls out during pregnancy. Then, after hormones stabilize, the hair will grow back. Any kind of physical trauma, such as a car accident, severe illness, or surgery, can lead to hair falling out. When you experience a stressful event, it can shock the hair cycle, forcing hair to shed. This is part of telogen effluvium hair loss – when hair quickly goes from its resting phase to its shedding phase. Luckily, this type of hair loss will grow back once the stress stops, and can take anywhere from three to six months. Not having a well-balanced diet can also cause hair loss, although only temporarily. Too much Vitamin A, either through supplements or medications can increase hair loss, as can a lack of protein in your diet. These are natural remedies for hair loss, so make sure you’re eating enough fish, meat, and eggs, to assist with hair regrowth. Learn more about the best foods that promote healthy hair growth and restoration. Depending on whether you are looking for a long-term or short-term solution for hair loss, there are products for hair regrowth or for hair cover up that can help. If you are still able to regrow hair and are interested in a long-term solution, then Toppik Women’s Hair Regrowth Treatment might be an appropriate solution. The treatment contains FDA-approved 2% Minoxidil, which is clinically proven to help regrow hair. Applied twice daily to the area of hair loss on the scalp, results can usually be seen in four months, but can sometimes take up to eight months to see generous hair regrowth. Continuous use of this product is needed in order to maintain hair regrowth. If you are looking for a cosmetic solution for hair cover up instead of a permanent one, there are still plenty of options available to you. For thin or thinning hair, Toppik Hair Building Fibers is the ideal product to use. Made of natural, colored Keratin protein that is statically charged, Toppik Hair Building Fibers intertwine with your existing hair to create a completely natural look. 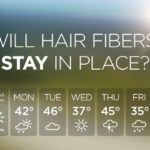 Hair Building Fibers will stay in your hair through wind, rain, and perspiration, but will easily wash out with shampoo. This makes Hair Building Fibers the simplest and quickest way to cover any signs of hair loss. To learn more about how hair fibers work, visit our blog post on Hair Building Fibers. To see more results and testimonials with Hair Building Fibers, visit our blog post on Hair Building Fibers Reviews. If you have larger areas of hair loss, scalp show-through or even bald spots, you will need a product that sticks to your scalp, and not only your hair. Toppik Colored Hair Thickener is a colored spray that instantly makes thinning hair look thick and full. It fills in thinning hair while also covering bald spots, and won’t rub off until you wash your hair with shampoo. No matter what type of hair loss you have, it’s always important to make sure you’re getting the right amount of vitamins and proteins your body needs. As we mentioned above, hair loss can be a result of poor diet, so eating the best foods that promote hair growth is crucial. Another way to ensure you’re getting the right amount of nutrients to your hair is to consider natural remedies for hair loss, such as a hair, skin, and nails vitamin that can help strengthen and nourish your hair from within. 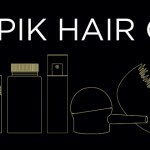 Have you tried any of our Toppik products to help with thinning hair or hair loss? Tell us in the comments section below what worked best for you! Now that we’ve discussed female hair loss and the best treatments, next week we’re showing you how to survive the cold, with our winter hair care tips! Question? Has there ever been any report or do you know of any possible side effects that comes with using Toppik? I’ve been thinning since I was 26. A barber once told me as a teen that I was going to have a problem later as I didn’t have much hair. He recommended that I keep it real short. Didn’t listen. Always kept it long. Ha ha. I thought. What did he know? For twenty five years did nothing due to embarrassment, & low funds. When I got brave & bought a wig. Wore it for a few years. It never really felt comfortable in it. It was straight hair & I have curley. Definitely not “me”. Then I read about toppik & saw you tube videos. I decided to try it. Was hard to find a store in town who sells it as I don’t want to buy anything online. Finally found it at one Shopper’s drug mart. make it look more natural . ( light brown, dark blonde & gray) I use the gray last. And then the hairspray. The result was super. The sad part is, I have noticeably lost hair since using toppik. Decided to only use it for special occasions. Have seriously considered buying a topper to clip on. Hi Pattie – We’re sorry to hear that you are still losing hair, unfortunately Toppik does not stop hair from thinning or hair loss. It is only a cosmetic solution to help cover any hair loss. Please let us know if we can help answer any questions you have about our products! I have been using Fullmore for about 3 yrs and really am gratful for it. It really covers my scalp and stays for a few days until I wash it out. I just feel very comfortable and noone is looking (and pitying) my bare scalp. I have just enough hair to hold it. I do wonder if it is healthy because it does spray a liquid with the fibres. time. If you use hair spray on the area where the fibers are, the fibers just stick to the scalp. I didn’t want to wash my hair every day, so the build up really made the hairloss worse. Such a dilemma. I now use a “topper” clip on that does not need hair spray or the Toppik….Just thought I’d comment and wondered if anyone else has had a problem with the keratin fibers clogging the pores of the scalp.